Bedrest Boutique: No More Pictures! 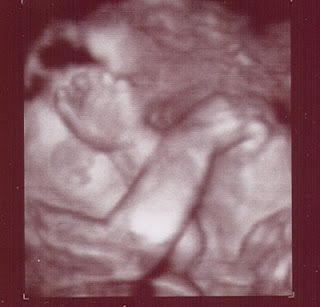 These are the latest ultrasound pictures taken earlier this week. I can't believe that she is covering her face with both hands. I realize that she has been a very photographed little peanut while in utero, but this is not even the beginning of what lies ahead! Hey! I just found out that my friend from college is pregnant with TWINS! I'm so excited for her. She's due Oct. 29th, and since she was married Jan 14th... you know what that means! Anyway, if you would please keep her in your prayers, i know she and the little ones and her hubby will much appreciate it! She's so small,i don't know how 2 will fit in there! 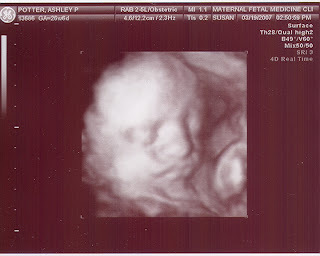 our baby didnt cooperate for the 4d u/s yesterday either. all we got was a barely distinguishable eye peeking out form between her hands. thats good that you got one shot of her face. impressive effort with the baby clothes. thank goodness i did the clothes before bedrest. i am fantazizing about getting our garage cleaned out with me laying on my reclining lawn chair. time to make room for baby! say my doc yesterday. full-on no outings at all for 4 weeks at least. i'm bummed. i get it but i feel guilty and sad and worried about missing out on my kids' lives, i.e. missing my son's 1st tball game, never taking him to school, missing my daughter's mommy and me class.... i know it is so worth it and important and probably wont bug them nearly as much as it bugs me. hmmm. i should've just emailed you this comment. hope things are going well at home.